1 What are help screens? 2 What is a local help server? Throughout the Administrator Back-end there are help screens available to guide you in your use of Joomla! You access these screens by clicking on the Help button on the toolbar. Each screen in the Administrator calls a different help screen so the information you are presented with is relevant to what you are looking at in Joomla! In addition, the Help -> Joomla! Help menu option presents you with an alphabetical list of all the help screens. Some installed components might also include their help screens on this list. By default, help screens are pulled from a remote server at help.joomla.org and displayed in a popup window. However, there is a setting in Global Configuration which allows you to change the location of the remote help server, or to pull help screens from a directory local to your website. What is a local help server? serve help screens from a server on your local intranet instead of help.joomla.org. customise the appearance of the help screens, for example, by adding a corporate logo or using a template that matches your own site style. use the English help screens as a starting point for a translation of the help screens into another language. The disadvantage to running your own local help server is that you will have to remember to update the help screens occasionally and you will have to maintain and secure an additional site. Important note: The following instructions show how to set up a local help server to serve help screens for Joomla! 1.5 installations. Please note that the local help server itself is a Joomla! 1.0 installation. It is possible to run the local help server under Joomla! 1.5 but the help screens are not yet available in the required format. Setting up a local help server is similar to installing Joomla! on your site. There is one major difference in the installation process though. In a normal Joomla! installation you would normally check the box “Install Sample Data” but when setting up a help server, do not be check this box off. 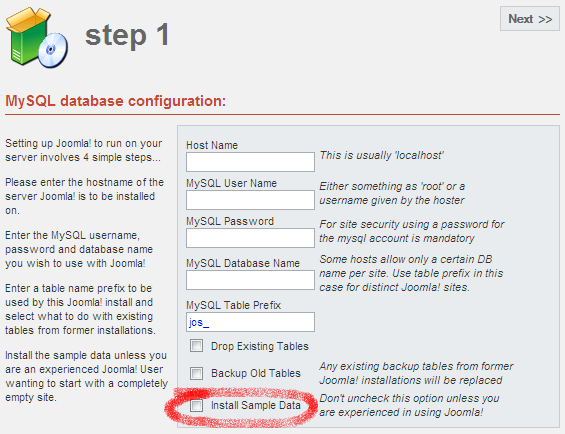 Important: Note the MySQL Table Prefix and the MySQL Database Name used when installing the Joomla! local help server. You will need to know these later. Complete the installation process as normal. When you have finished the installation process you will need to delete the <joomla-root>/installation directory. Note that the date forms part of the filename so ensure that you download the latest version. Extract it to a directory on your local computer, then upload all the files into the <joomla-root>/images/stories directory of your help server. Or upload the images.zip to your help server and extract it into the <joomla-root>/images/stories directory using the server control panel or a command-line instruction in an SSH session. This method requires appropriate access to your help server. The default MySQL Table Prefix for a Joomla! 1.0 installation is jos_. If your MySQL Table Prefix (which you noted in Step 1) is not jos_ then you will need to amend all five of the .txt.sql files before they can be used. To amend the files, open each one in turn using a text editor. Do not use a word processing program. Using the Find and Replace or similar function, replace all instances of jos_ with your MySQL Table Prefix. Repeat this for all five files. Open phpMyAdmin or a similar MySQL database management tool. Navigate to the database used by your Joomla! local help server. Go to the Import page. Browse to each of the .txt.sql files and click the Go button. Repeat this process for each file in turn. The order in which you import them does not matter. This completes the process of setting up your local help server. Try clicking on some of these items and make sure that the help screens are displaying correctly. In particular, check that the screenshots and other images are being shown. If they are not then check the directory structure in the <joomla-root>/images/stories directory as it is important that this is set up correctly. Log into the Joomla! Back End of your Joomla! 1.5 site, not the local help server. Go to Site -> Global Configuration. Click on the System tab. Find the System Settings group and within that the Help Server field. This is a drop-down selection list. Click on it and select your new local help server from the list. Save your changes to Global Configuration. Go to any screen in the Joomla! Back End and click on the Help toolbar button. You should see the appropriate help screen in a popup window, served from your local help server. As multiple Joomla! 1.5 sites can share the same local help server, you will need to repeat these steps for each Joomla! 1.5 site. This page was adapted from an original document produced during the GHOP Contest by igeoffi. This page was last modified on 18 October 2012, at 17:13.